Owners have the largest mortgages in history! It’s no secret that the housing market has been unbalanced over the past few years. Prices have been rising, and with them, so have average home loans. 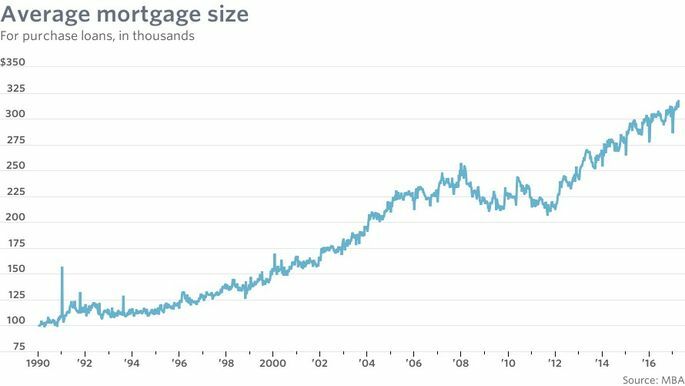 According to The Mortgage Bankers Association (MBA), the average home loan size is the largest its been in the history of its survey, which began in 1990. Additionally, the median mortgage size was only about 3.3 times the median annual income in 1990 – now, it’s more than 5 times as big. This is likely due to the increase in housing prices, buyers getting bigger homes and lower interest rates over the years. Here’s a look at some housing market characteristics for select years. According to Mike Ervin of Supreme Lending, people are just waiting and waiting for mortgage rates to go down. People who are using securitizers like Fannie Mae and Freddie Mac have to wait until the Fed buys up more mortgage bonds so that rates will go down. It is unknown if that will happen, but rates have dropped in 2017. Multiple factors can affect the bond and mortgage markets. The most recent major event was the Trump election and presidency, which saw a large immediate increase in mortgage rates, which have since rebounded, even with the Fed raising rates. In California, we are in the wealth-building business and real estate in the Bay Area is going to be a good investment for years to come. I am here to advise, provide insight and help you build wealth through real estate. Author KristinPosted on June 13, 2017 June 13, 2017 Categories Featured, Market Update, Real EstateTags annual income, bonds, election, Fannie Mae, Fed, Freddie Mac, housing market, Kristin Lanham, largest, market characteristics, median, Mike Ervin, Mortgage Bankers Association, mortgage rates, presidency, prices, real estate, Realtor.com, rising, securitizers, Supreme Lending, Trump, Walnut Creek LifestyleLeave a comment on Owners have the largest mortgages in history! Will the Presidential race affect our mortgage rates? I thought this might be interesting to share. Traditionally, there is very little on the market as we enter the holiday season. The last couple years, sellers listing in December and the beginning of January tended to have multiple offers because there isn’t much inventory (meaning, people don’t like to have Open Houses or showings during the holiday season as they are usually entertaining family or friends). We have blogged several times about how rates are not held artificially low prior to major elections. It is a myth that they are. Presidents, in fact, like to see proof that the economy is getting stronger, and these signs usually push rates higher. Presidents hope for positive signs like GDP growth, job growth, lower unemployment, etc. These signs usually push investors into stocks and out of bonds, causing rates to go up. With respect to Donald Trump and Hillary Clinton, it is all about “stability.” Stock market investors like “stability” as much as they like growth. Worries about instability or shakeups send investors away from stocks and into the safety of bonds (pushing rates down). Investors believe that Clinton will follow President Obama’s course, and this is perceived as “stability.” So, signs that Clinton might win will probably keep investors in stocks, which will ultimately keep rates largely the same. Investors are not sure what Trump might do, so signs that Trump might win will probably push investors to the safety of bonds, pushing rates lower. This is very similar to the uncertainty the Brexit vote created and its influence in pushing rates lower. Author KristinPosted on October 11, 2016 October 11, 2016 Categories Featured, Real EstateTags bonds, Brexit, Clinton, down, election, higher, investors, Jay Vorhees, JVM Lending, lower, Obama, President, Presidential, race, stock market, stocks, Trump, upLeave a comment on Will the Presidential race affect our mortgage rates?